InterYield pop-up is the PUP that uses misleading techniques to prevent removal. Use Reimage to locate malicious components and get rid of them faster than with uninstall instructions. A full system scan blocks virus reappearance and prevents traffic to malicious domains. How did InterYield hijack my computer? How to remove InterYield virus from my computer? InterYield is classified as an advertising platform that is used by various ad-supported programs to display their advertisements and other commercial messages for people when they are browsing on the web. In other words, it’s yet another ‘adware’ and ‘potentially unwanted program’ that is mainly distributed via freewares/sharewares as a recommended component. That’s why there are so many people who cannot explain how and when InterYield adware has entered their computers. Beware of it because it is set to generate sponsored advertisements linked to affiliated websites, what means that you may continuously be forced to visit unreliable third-party websites. Besides, it is also infamous for spying on the users with the help of cookies. It has been revealed that those cookies are capable of investigating and storing information related to user’s web browsing, for example, pages viewed, websites visited, search terms, clicks, IP address, PC’s location, and so on. 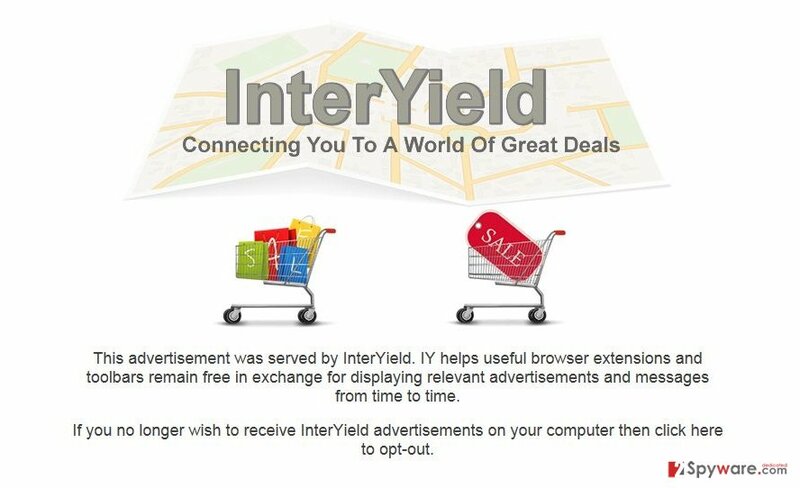 Therefore, if you are experiencing InterYield redirects, receiving advertisements labeled as “Ads by InterYield”, “Powered by InterYield”, “InterYield Deals”, “Brought to you by InterYield”, etc. continuously, and similar things, it means that this adware-type program has already infiltrated your system. If that is the case, you should check what freeware you have recently installed because it’s very likely that it have been bundled with InterYield virus. As we have already mentioned, it may cause a variety of inconveniences during your browsing, so it’s pointless to keep it installed. The best solution for InterYield adware removal would be a full system check with Reimage or another reliable anti-spyware. InterYield and similar ad-supported programs are usually traveling together with freewares and sharewares. Free programs are often filled with unwanted attachments, so if you want to avoid them, you should be very careful with the free programs that you are installing. We can give you a couple of helpful tips on how to avoid and how to remove such useless intruders as InterYield adware. First of all, if you want to install a program that you are not familiar with, read comments and reviews written by people who have already installed and used this program for some time. Secondly, you should read EULA (end-user license agreement) section and don’t rush the installation process. Take it slowly and never speed up the installation by clicking the next button all the time. Finally, if you have decided that this program is safe enough, select advanced installation option, follow the entire progress closely, and unmark all doubtful / unwanted extensions along the way. You should remove this doubtful plug-in as soon as possible because leaving it on your computer may result in the loss of your private information or the infiltration of serious cyber threats. That’s because InterYield ads are not only irritating. Some of them may be involved in the distribution of other potentially unwanted programs or even malware. If you have already decided to remove InterYield add-on, you can do this by yourself with the help of manual removal guidelines that are provided down below. After that, you are strongly advised to check the system with a reliable anti-malware in order to get rid of all other PUPs. Here, look for InterYield pop-up or any other recently installed suspicious programs. Wait until you see Applications folder and look for InterYield pop-up or any other suspicious programs on it. Now right click on every of such entries and select Move to Trash. When in the new window, check Delete personal settings and select Reset again to complete InterYield pop-up removal. Once these steps are finished, InterYield pop-up should be removed from your Microsoft Edge browser. Here, select InterYield pop-up and other questionable plugins. Click Remove to delete these entries. Now you will see Reset Firefox to its default state message with Reset Firefox button. Click this button for several times and complete InterYield pop-up removal. Here, select InterYield pop-up and other malicious plugins and select trash icon to delete these entries. Click Reset to confirm this action and complete InterYield pop-up removal. Here, select Extensions and look for InterYield pop-up or other suspicious entries. Click on the Uninstall button to get rid each of them. Now you will see a detailed dialog window filled with reset options. All of those options are usually checked, but you can specify which of them you want to reset. Click the Reset button to complete InterYield pop-up removal process. 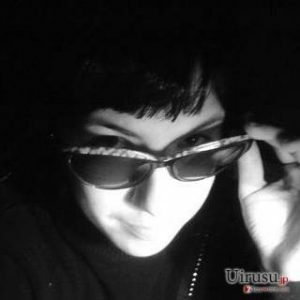 This entry was posted on 2015-10-01 at 00:56 and is filed under Adware, Viruses. You can quickly scan the QR code with your mobile device and have InterYield pop-up ads manual removal instructions right in your pocket. How did you remove InterYield pop-up ads?